My 69-year-old uncle Henry gazed into the jaws of the Natural History Museum’s biggest celebrity, Thomas the T. rex, who was frozen in a silent roar. I made a mental note. Later, I added the entry to the unique dictionary Henry and I are creating together. We call it a “thicktionary.” It documents the language of his mental illness. Other entries include “Chicano,” which means Americano, and “alligator,” which means you want to make friends with them but they have their own defensive mechanisms. Henry, my oldest paternal uncle, has lived a life that’s constantly taken him in and out of danger—a life that has made me consider about what danger really means. Even in my earliest memories of Henry, I feared the words that might come out of his mouth. My throat tightened. I wished my uncle would vanish. After dinner, a cousin pulled me aside to whisper, “When we were driving home a couple of weeks ago, my mom pulled over ’cause she saw police shoving a homeless man. She started crying because it was …” Her finger pointed in the direction of Henry, who was wearing the same clothes he’d worn last Christmas, which smelled as if he’d worn them every day since. He disappeared early from that dinner, riding his bike into the evening. Before driving us the 150 miles home to Santa Maria, my father went looking for Henry in Norwalk, where he and Henry grew up. With us kids looking on from the car, he found Henry camped out in front of a Wienerschnitzel near his childhood home, his possessions bundled and bungeed to a 10-speed that looked as worn as he did. My father parked, walked to Henry, and handed a pile of McDonald’s gift certificates to a man whose intelligence had so impressed the Army in 1967 that they enrolled him in officer candidate school in Fort Sill, Oklahoma. When Henry’s draft letter came, he went to basic training, then for training in field artillery, and then to northern Vietnam. Henry says the most dangerous part of Vietnam was that “your ammunition might go off to early. You could be eradicated in full respects.” He felt a great responsibility for other people’s lives. After Henry returned from the battlefield, he briefly attended college using GI Bill money. Then, he started avoiding baths. He started asking my father and his sisters if they, too, could hear the voices of the people he’d killed or hurt in Vietnam. He put his Bronze Stars in a coffee tin, carried it to the backyard, and held a funeral for his medals. My aunt took Henry to the Veterans Administration Hospital in Long Beach. The VA doctor diagnosed him with schizophrenia. Mental health organizations often cite schizophrenia as one of the most debilitating mental illnesses. It manifests through disorganized thoughts and perceptions. It reconstitutes reality, and a person with schizophrenia might see, or, more often, hear things that others do not. The language of schizophrenic people is particularly compelling. A schizophrenic might speak in constant poetry. Metaphors and other abstractions mire their speech, making their intent a beautiful mystery. While the doctor did not explicitly state that Henry’s tour of duty triggered his decline, it’s hard to see how war didn’t worsen something that’s often at least partly genetic. 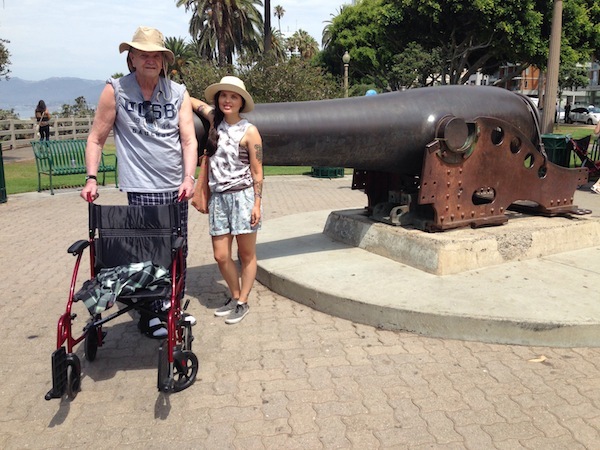 In the years after his diagnosis, Henry experienced bouts of homelessness, but as he aged, he returned more and more to his childhood home in Norwalk. This tract home sat unoccupied after my grandmother remarried. Henry stuffed the house full of treasures salvaged from dumpsters or exchanged for pennies at swap meets. My father and brother used to drive three to four hours from Santa Maria to visit Henry every month. In 2012, during a historic summer heat wave, Henry’s neighbor phoned my father after seeing Henry collapse in his front yard. I lived 20 minutes away, so my father asked me to meet the social workers he called about Henry. I met two male social workers on nearby train tracks—tracks my father and Henry played on as children. The social workers lectured me on Henry’s civil rights, stressing that it was unlikely that they could do anything for him. I nodded, silently cried, and walked them to the driveway. The color disappeared from their faces when they saw my dehydrated uncle, looking like a castaway, crouched on a strip of soiled carpet. Grime, including his own feces and urine, caked his clothes and person. He held a pair of rusty, yet sharp shears at arm’s length. He aimed these at the men. An ambulance drove Henry to a Long Beach hospital. I followed behind the gurney as paramedics wheeled Henry into the psychiatric unit. There, I helped him bathe and change into a gown, and placed his clothes and belongings in a plastic bag. I had unofficially become Henry’s translator. Mostly I glean what he means through deductive reasoning. For example, Henry once pointed to empty wall space above his bed, where his calendar had been hanging, and said, “My chickens flew away. Have you seen them?” Each calendar month features a large, glossy hen photo. Chickens mark Henry’s concept of time. “We’ll find your calendar,” I promised. We did. Decoding his intent is a matter of listening, and looking, and keeping track of the other relationships in his “thicktionary.” But Henry needs more than translation. Getting him proper care has been a battle. When my father went to the VA Santa Maria Clinic to ask how he could get medical care for Henry, a representative insisted Henry had to go to a VA hospital to seek it. When my father protested that Henry’s mental illness made that complicated, the representative insisted that Henry’s “military training would make it easy for him to navigate the system.” But aside from the initial diagnosis, the VA has done nothing to attend to his psychological needs. Henry doesn’t necessarily want care from the VA either—though we family members know he’s entitled to it. He doesn’t trust the Army or anything related to it. He once told my father, “They tried to kill me once. I’m not going to give them a second chance.” The only time we experienced timely attention was after we phoned Henry’s congresswoman’s office. The VA has also failed to place Henry in one of its nursing facilities, even though we requested it about a year ago. Medi-Cal, health insurance for low-income Californians, covers Henry’s care at the residential nursing facility where he lives now. But of the dangers Henry has faced, the worst is loneliness. That’s why Henry knows the name of every resident, doctor, clerk, administrator, nurse, and orderly at his nursing facility, and when he sees them, he smiles and greets them. They smile back and greet him. I moved to within five minutes of Henry in Long Beach and visit him at least twice a week. I take him to the Santa Monica Pier, Chinatown, the tar pits, and the zoo—places that evoke childhood memories or that have animals. During our outings, Henry often talks to strangers and I watch, observing how once Henry’s words dip into the poetry of schizophrenia, listeners’ facial expressions shift. Their facial features conspire to say, “This dude is crazy.” They turn and walk away. But my time with him has taught me that, with love—and by love, I don’t mean greeting-card sentiments but love founded on expansive curiosity—Henry can be understood. And one of the primary shifts in my understanding of Henry is that it’s easy to feel that he is a danger. It’s harder, but vastly more loving and real, to appreciate how for him, everything is dangerous. Myriam Gurba is a teacher, artist, and writer. She is the author of Dahlia Season, a novella and short story collection, and Wish You Were Me, a poetry collection. She writes an irregular arts and literature column at radarproductions.org. *Photo courtesy of Myriam Gurba.